Among the DIY projects that I’m undertaking, one are the boutonnières for my groom and his groomsmen. Two elements that I’m incorporating into my Art Nouveau/Art Deco vintage theme are peacock feathers and calla lilies. My main color is emerald green with purple, turquoise, cobalt and fuchsia as accent colors — basically jewel tones. The only fresh cut flowers that I’m using for my wedding are for the bridal party bouquets (calla lilies and mini calla lilies). I would really like my fiance to wear a calla lily boutonnière, so I was looking through my Offray Glorious Weddings book and found instruction on making a calla lily out of ribbon. The widest wire-edged ivory satin ribbon that I could find over the weekend was 1 1/2″ and after making one with that, I thought it was far too small. I decided to add a small peacock feather to enhance it, but still am not sure whether I’m happy about it. I used a 2.5″ Victoria Lynn leaf spray purchased at Beverly’s and wired 6mm tourmaline Crystazzi crystals. 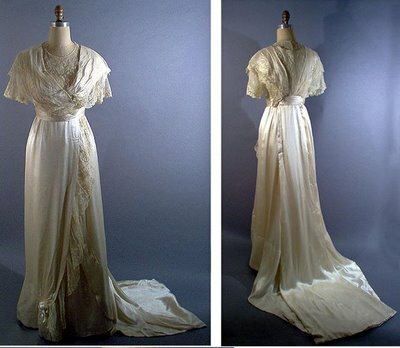 The calla lily is Offray 1 1/2″ wire-edged ribbon in antique white with a yellow chenille stem. The boutonnière is secured first with floral wire, then wrapped with floral tape and finally with Offray 1/4″ green satin ribbon. Since I don’t like the size of the flower, I’m thinking of making one out my wedding dress fabric. That’ll take a little experimentation to figure that out, but I don’t think it’ll be that difficult. 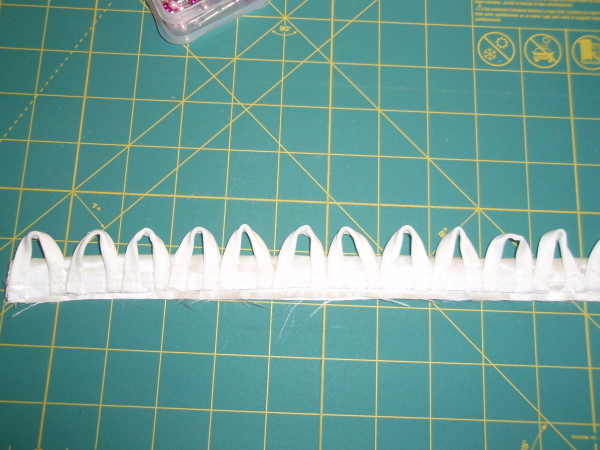 I also don’t like the chenille stem and think it looks out of place, so I’ll be making one out of beads instead. 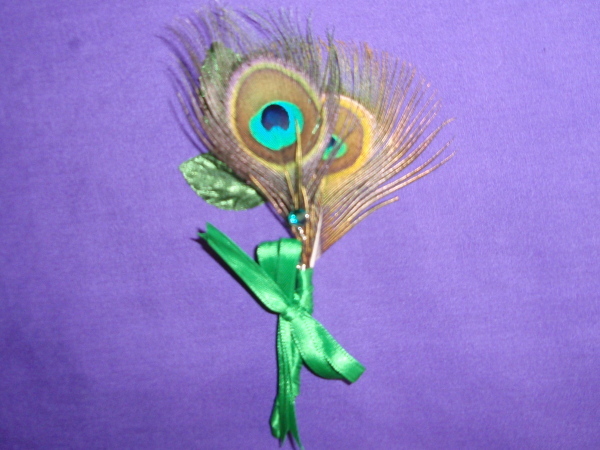 My next experiment was with a peacock feather boutonnière. I was planning on making these for the groomsmen, but was also considering this boutonnière for my fiance as well. 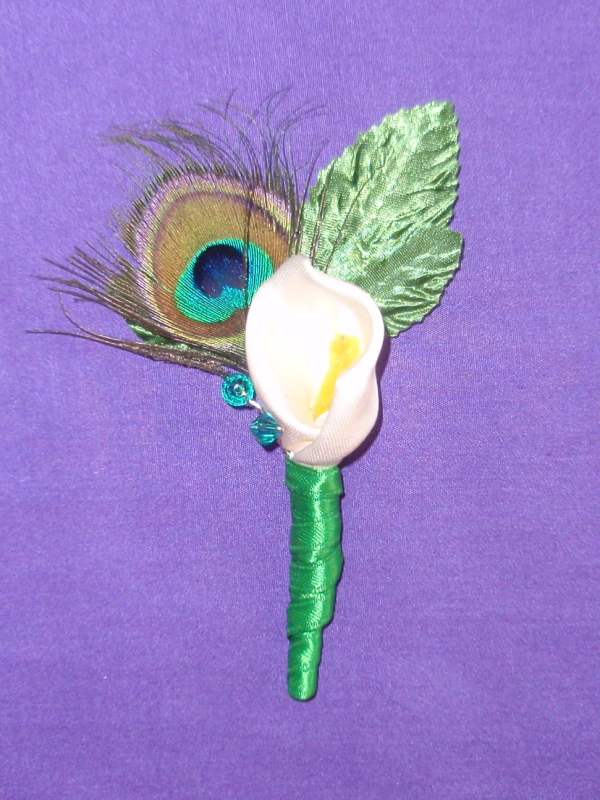 This boutonnière is made much the same way, but with two feathers. I couldn’t get the bow to stay in place, so when I make the next one, I’ll probably sew the bow in place. I also think the stem is a little too long, so I’ll be shortening that on the next one. Thankfully, these aren’t too difficult to take apart and reuse the materials!